This example shows the importance of choosing an appropriate solver for optimization problems. It also shows that a single point of non-smoothness can cause problems for Optimization Toolbox™ solvers. In general, the solver decision tables provide guidance on which solver is likely to work best for your problem. For smooth problems, see Optimization Decision Table (Optimization Toolbox). For nonsmooth problems, see Table for Choosing a Solver first, and for more information consult Global Optimization Toolbox Solver Characteristics. The function f(x)=||x||1/2 is nonsmooth at the point 0, which is the minimizing point. 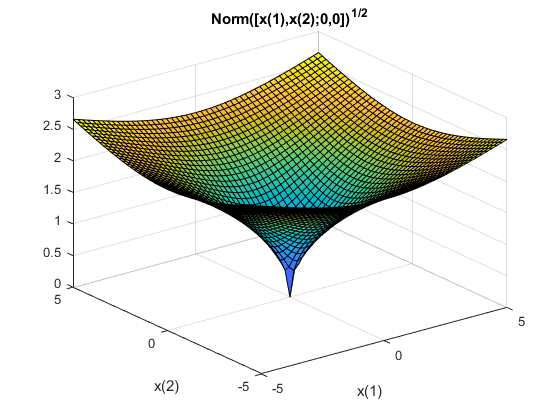 Here is a 2-D plot using the matrix norm for the 4-D point [x(1)x(2)00] . This example uses matrix norm for a 2-by-6 matrix x. The matrix norm relates to the singular value decomposition, which is not as smooth as the Euclidean norm. See 2-Norm of Matrix (MATLAB). patternsearch is the recommended first solver to try for nonsmooth problems. See Table for Choosing a Solver. Start patternsearch from a nonzero 2-by-6 matrix x0, and attempt to locate the minimum of f. For this attempt, and all others, use the default solver options. Return the solution, which should be near zero, the objective function value, which should likewise be near zero, and the number of function evaluations taken. patternsearch reaches a good solution, as evinced by exit flag 1. However, it takes over 10,000 function evaluations to converge. The documentation states that fminsearch sometimes can handle discontinuities, so this is a reasonable option. Using default options, fminsearch runs out of function evaluations before it converges to a solution. Exit flag 0 indicates this lack of convergence. The reported solution is poor. particleswarm is recommended as the next solver to try. See Choosing Between Solvers for Nonsmooth Problems. 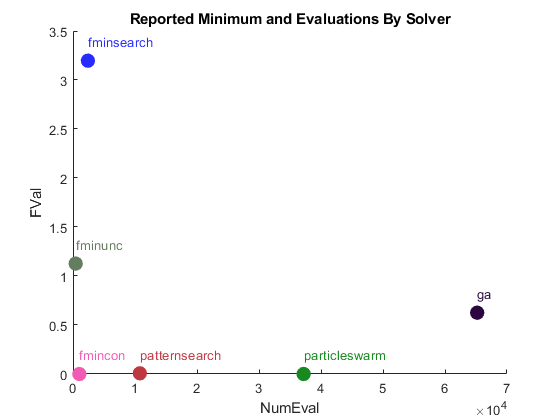 particleswarm finds an even more accurate solution than patternsearch, but takes over 35,000 function evaluations. Exit flag 1 indicates that the solution is good. ga is a popular solver, but is not recommended as the first solver to try. See how well it works on this problem. ga does not find as good a solution as patternsearch or particleswarm, and takes about twice as many function evaluations as particleswarm. Exit flag 1 is misleading in this case. fminunc is not recommended for nonsmooth functions. See how it performs on this one. The fminunc solution is not as good as the ga solution. However, fminunc reaches the rather poor solution in relatively few function evaluations. Exit flag 2 means you should take care, the first-order optimality conditions are not met at the reported solution. fmincon can sometimes minimize nonsmooth functions. See how it performs on this one. fmincon with default options produces an accurate solution after fewer than 1000 function evaluations. Exit flag 2 does not mean that the solution is inaccurate, but that the first-order optimality conditions are not met. This is because the gradient of the objective function is not zero at the solution. Choosing the appropriate solver leads to better, faster results. This summary shows how disparate the results can be. The solution quality is 'Poor' if the objective function value is greater than 0.1, 'Good' if the value is smaller than 0.01, and 'Mediocre' otherwise. Another view of the results. While particleswarm achieves the lowest objective function value, it does so by taking over three times as many function evaluations as patternsearch, and over 30 times as many as fmincon. fmincon is not generally recommended for nonsmooth problems. It is effective in this case, but this case has just one nonsmooth point.